While emerging markets have been my area of focus for several decades, I also travel extensively to developed countries, too. It’s quite enlightening to see how once “emerging” countries still cherish their heritage. I also find it interesting to compare various areas of progress between the different markets and what sectors or industries are receiving the most attention. In some cases, it is surprising to see where emerging economies are taking the lead. On my most recent trip to Europe, I decided to take some time off to visit my father’s hometown of Erlbach near Dresden, Germany. As we drove to Erlbach, I was struck by how much the scenery must have changed since my father’s day. German drivers seem to have a penchant for high speeds! Speeding along the autobahn at 150 kilometers per hour was a little frightening to me, but I was able to see the many power-generating windmills towering over the farm lands alongside the road. Germany now produces a large part of its energy from wind power and solar. In 2016, total installed capacity of wind power in Germany produces about 13% of the country’s total electricity needs, and solar power from photoelectric cells produces about 6%.1 The numbers have been increasing, and during some periods of time over the past few years, these renewable energy sources have met more than 50% of Germany’s energy needs. Visiting small towns all over Germany it is common to see photovoltaic installation on rooftops. Germany has set a goal of relying exclusively on renewable energy by 2050. While Germany is still regarded as a world leader in renewable energy use, it’s interesting to note China is actually the world’s largest producer and consumer of solar panels. The Chinese government announced a planned investment of US$360 billion in renewable energy by 20202 , which looks to position China at the top of the renewables race. With a huge appetite for energy and an equally large pollution problem in some cities, it makes sense that China’s government is offering incentives to shift to solar and away from coal. China actually boasts the world’s largest floating solar “farm” over an old rainwater-filled, coal-mining operation. In Germany, my mission wasn’t only to marvel at windmills and solar panels. Arriving in Erlbach, the small village where my father was born, there is a small but elegant church situated on a hill overlooking the village. This was my destination, as the church contains something very special inside. There are gravestones on one side of the church, one bearing the Mobius family name. It wasn’t my first time in Erlbach. Many years ago, I crossed the Berlin Wall when it was still Communist East Germany. Around that time Vladimir Putin, Russia’s current president, was serving as a KGB officer in nearby Dresden. In order to enter East Germany, I had to get all kinds of documentation from the East German embassy in London. When my cousin Wolfgang met me at Berlin’s “Checkpoint Charlie” with his beautiful wife and two little girls, they whispered to me not to say anything politically sensitive in front of the children since their teacher would probably ask them about their “guest” from the West and what that guest said. We drove to their house near the famous Colditz Castle, where Wolfgang had his dental clinic. Colditz is best remembered as the World War II prison for Allied officers. It was the scene of a cat-and-mouse game between the captors and captives with the Allied officers thinking of ingenious ways to outsmart their German captors and escape. The story has been told in books and a few movies. Today, it’s a museum and you can see the incredible ruses the Allied officers dreamed up to escape, some of them succeeding. After refreshments at Wolfgang’s home, we drove to Erlbach and met my uncle Otto. 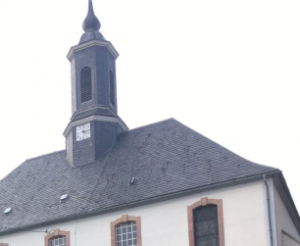 He took us to the elegant, small Erlbach church. Inside the church, my uncle played a beautiful Bach fugue on its organ. I was really impressed by the beauty of the sound in the wooden church. The acoustics were perfect. 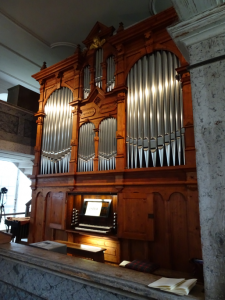 Over the years, the church’s organ had deteriorated and needed some work. In 2016, I contributed some money for the organ’s rehabilitation that held fond memories for my family. The organ held a wonderful surprise uncovered during the renovation. Today an electric motor powers the organ’s air, but many years ago someone had to pump pedals behind the organ to produce the necessary air. Young boys were usually recruited to do the job. Behind the organ, we discovered the old foot pedals, and facing the pedals was a wood wall which had a lot of scratches on it. Those scratches were the doodling of the boys who passed the time while doing the boring job of operating the pedals and looking at that wall. To my delight, I found my father’s name scratched on the wall! It was quite a thrill for me to see that and gave me a glimpse into the kind of life my father lived in that small village before emigrating to the United States in his twenties. It made me even more pleased that I could help restore this beautiful instrument. When the organ was repaired, all the old steel pipes were sold to members of the congregation and they gave me one. It makes a nice sound when I blow on the pointed end. 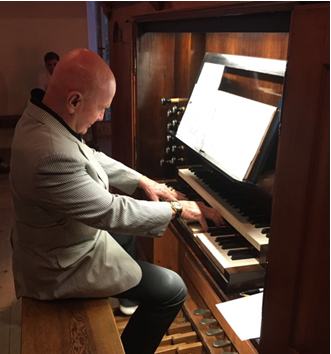 At the time of the repaired organ’s inauguration, a noted organist from Berlin gave a concert along with other members of my extended family who are very musical. During the organ’s inauguration ceremony, the history of the church and the town was also reenacted with pictures and dialogue. Another great experience for me. On my trip back to Erlbach this year, I invited my Hong Kong-based colleague Eddie Chow and his son Ashley, who expertly plays the organ. It was quite inspiring to hear Ashley play a number of complex Bach pieces before a gathering of about 50 locals in Germany. Seeing a Chinese boy playing the organ in this isolated little farming village was something special for all the townfolks. Ashley impressed everyone and received a long round of applause. Music is something that truly brings people together, from all over the world. Before this recent trip, I had taken a cruise ship on the Elbe River from Hamburg to Dresden. It was a journey my father also took long ago, but in the opposite direction. He traveled the Elbe River to Hamburg where he joined the crew of a ship traveling to New York. My family has tracked the records of his landings in New York, where he met my mother, an immigrant from Puerto Rico. They met and fell in love even though they had a big language barrier. My father’s English was not good and my mother spoke no German. My parents married in New York and returned to Erlbach to meet my father’s relatives for their honeymoon. Rumblings of the rise of Nazi power and the possibilities of war brought them back to New York, separating them from the rest of my father’s siblings who were stuck in Germany. Dresden is dominated by the fabulous palaces and churches built by the electors and kings of Saxony who brought together the best musicians, architects and painters from all over Europe. It has often been called the “Jewel Box” because of the splendor of its baroque and rococo buildings. During World War II, American and British bombing essentially obliterated the entire city center, including all the fabulous historic buildings. Many of the buildings have been restored and rebuilt to their original glory, which is a testament to the German people’s determination to reconstruct and revive the city. There are many wonderful art collections to see. The Zwinger Palace houses the royal art collections, which include paintings and elaborate porcelain, clocks, jewelry and other objects. The Elbe cruise gave me a good picture of the area’s rich history with its global significance, particularly in the history of Christianity. I think it’s important for us to recall our ancestral origins and learn the lessons of history. Many emerging economies today are in fact learning from the successes—and failures—of the developed world as they transform and grow into global powers. The comments, opinions and analyses expressed herein are personal views and are intended to be for informational purposes and general interest only and should not be construed as individual investment advice or a recommendation or solicitation to buy, sell or hold any security or to adopt any investment strategy. It does not constitute legal or tax advice. The information provided in this material is rendered as at publication date and may change without notice, and it is not intended as a complete analysis of every material fact regarding any country, region market or investment. 1. Source: Bundesministerium für Wirtschaft und Energie, Data as of 2016. 2. Source: Economic Research Institute For ASEAN and East Asia, “Is the United States Ceding the Climate and Clean Energy Leadership to China?” May 26, 2017.